Our scheme maintains the Grand Army Plaza design integrity, while making the necessary alterations to physically connect the cultural infrastructure as well as the public, vehicular and pedestrian circulations. Our minimal intervention maintains the cross-vistas to and from the Plaza oval, enhances the connections and encourages accessibility weaving together the surrounding and larger context. Our scheme picks-up and completes the Design Trusts’ proposal to close the roadbed between the plaza and Prospect Park, (however permanently and not just on weekends), allowing pedestrians to access the oval without crossing lanes of traffic. - diminish the traffic on the outer ring, which we deem too close to the residential areas. - maintain the berms because of their buffering and historical values. - provide a functional civic space for the exchange of public and local circulation. - connect the Park to the greenery of the Plaza and to maintain a dedicated space for the green market for everyday year round use. - create a fully accessible plaza, served by a building housing the circulation hub and the Plaza information center. In order to maintain the berms, the access from Flatbush and Vanderbilt Avenues and the access from Eastern Parkway to Prospect Park West are maintained by partially earthing the two lane roads in the oval. 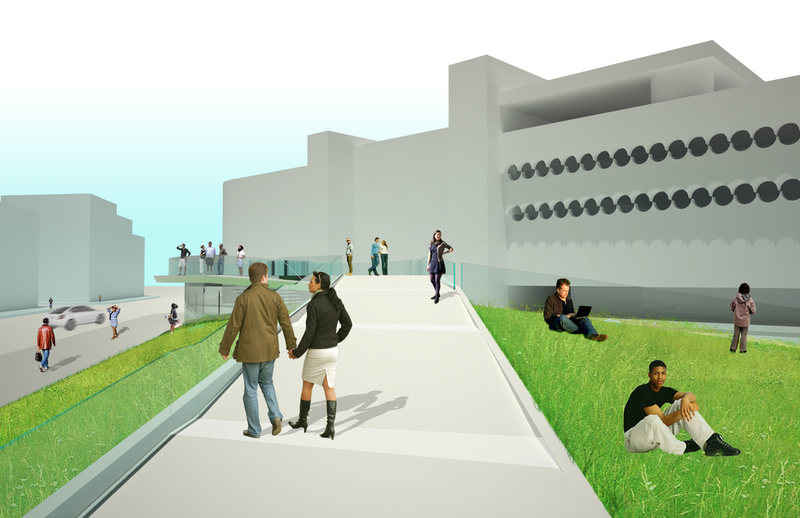 The loss of green space occupied by the roads is balanced by the extension, from the apex of the berm towards the oval, of a raised “high-walk”, thisaccomplishes both functions, to cover and insulate the road below, as well as to create a scenic, architectural promenade for bicycling, strolling and running. The new raised path transforms the previously passive berms into a new “active” landscape, leaving the oval inside as a precious, more passive oasis. The path is completely handicapped accessible, since it starts at zero on the Prospect Park side and remains at a constant level, taking advantage of the ground sloping down 25’ towards Vanderbilt Avenue; the path finally ends and melds into the volumes of the oval transportation hub building, where ramps connect to the ground. The interstitial vertical space, between the “highwalk” and the existing inner park, allows for the introduction of public space opening directly towards the arch and the adjacent transportation hub, also allows for the introduction of park amenities, concession services and support spaces for year round use. These stacked terrains create alternate ground augmenting the existing topography; the park is connected to the promenade level and the pedestrian walk to the park, repairing the transition between of the city parts. The space previously occupied by the ad-hoc paved areas at the entrance of the Park, becomes, in our proposal, semi-green and can house the green market year round, while the paved public plaza is re-positioned at the intersection of the main avenues, in front of the transportation hub and buses drop-off. Entry selected as one of thirty exhibited at the Reinventing Grand Army Competition Exhibit held in the Plaza in September 2008. The PARKWALK project maintains the Grand Concourse’s linear design, integrating the built environment and nature. Circulation augmented by public space creates a new fabricated topography and cultural experience. The bending and rolling elevated sidewalks celebrate the grandeur of the concourse and frame vistas revealing its true potential. The PARKWALK project revitalizes its neighborhoods with community gardens, public spaces, linear parks and potential for sustainability and sharing of its diverse culture. connecting the upper and lower corridors of the linear Park. It accommodates both concealed intimate viewing as well as the social, turning the unused Highline underbelly into a functional civic space; not dissimilarly to a well tailored jacket, you can learn more about its construction by looking at the inside under the lining rather than the exterior. 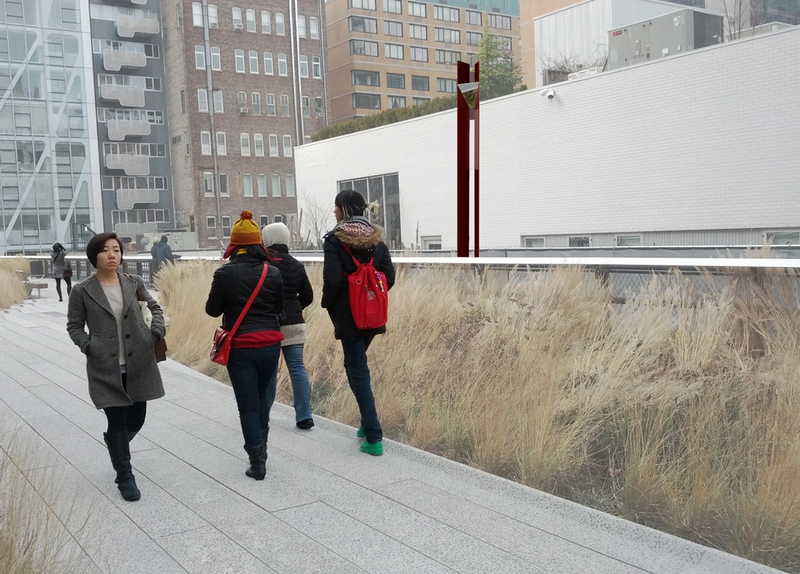 The two periscopes that anchor the installation change the habitual viewing perspective,of the High Line, collecting live feed, both at walking and at bird's eye level, along different points.In a surprising reversal of the viewing vectors, the fresh perspective is curiously the one from the most exclusive area residential units. These projections allow The Underline visitors to progress through the pavilion as they would the High Line, whose 20 blocks lenght is condensed within the length of the site. This provocation of traveling beneath the High Line to understand its’ birdseye views will entice the public to visit the underLine, and the way in which it transforms with the weather and time of the day, will keep the visitors coming back. The PARK OF AWARENESS is a “device” that inspires and directs the behavior and actions of the visitor, a layered landscape, an overlapping built environment, nature, and cultural experience with historic significance. The Red Ribbon symbol was chosen because of its strong commemorative narrative and its positive consciousness raising meaning. 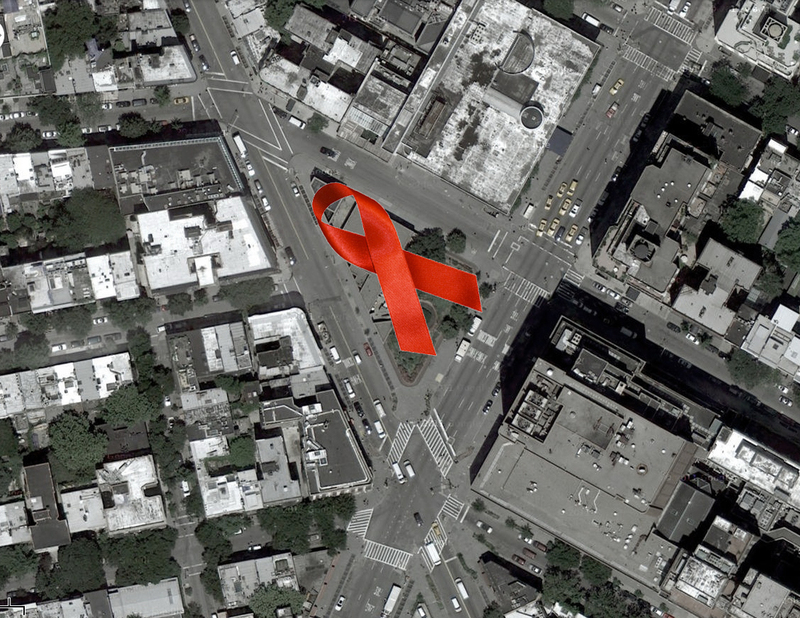 The image of the crossing arms stands in the West Village where the AIDS crisis found its epicenter. 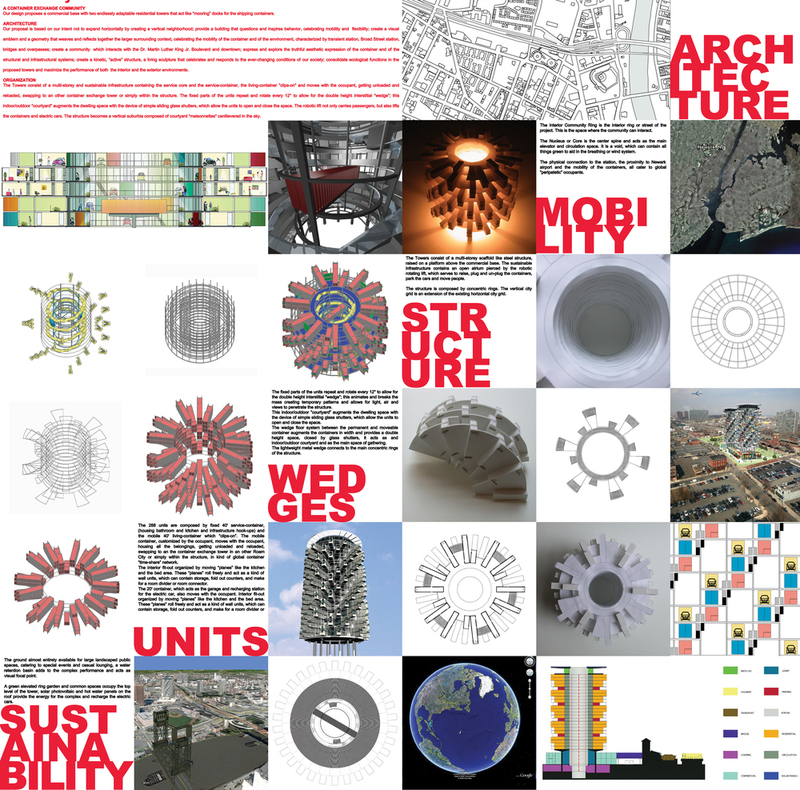 The tridimensional and geometrical shape of the awareness ribbon not only effortlessly fits the site, but also the program, since it defines circulation, creates an “active” but accessible landscape, increases the site visibility, marks the area as the hub of the surrounding circulation, stands at the epicenter of the crisis, provides for additional height and light to the lower level. Evoking the fluid form of the awareness ribbon, the integrated three dimensional system of rolling pathways extends into the surrounding urban context and relevant site lines, while repairing and building urban connections, merging the diversified layers of the city. The proposed complex merges the PARK OF AWARENESS with the existing historic West Village, 70’s buildings of controversial significance to create the new contemporary city-scape. The gentle arching of the ribbon augments the existing lower level, supporting park and cultural activities and creating a hub below for exhibition, research, quite contemplation and technical support spaces. This augmented topography is a new kind of public space, it combines functional circulation with gardens, provides light and views down into the lower level and sculpt previously unseen views far into the city. The reused existing lower level is augmented by the additional square footage at street level, where the entrance and concession kiosk find space. The glass volumes housing the elevator and stair connect to the below ground level where the double height exhibition and performance spaces are located, as well the interactive learning center, support spaces for year-round use, mechanical and egress. THE NEW LIGHT RAIL PATH, creates a Linear ground plane, car free river to river WITH A FULLY PEDESTRIAN CENTER. 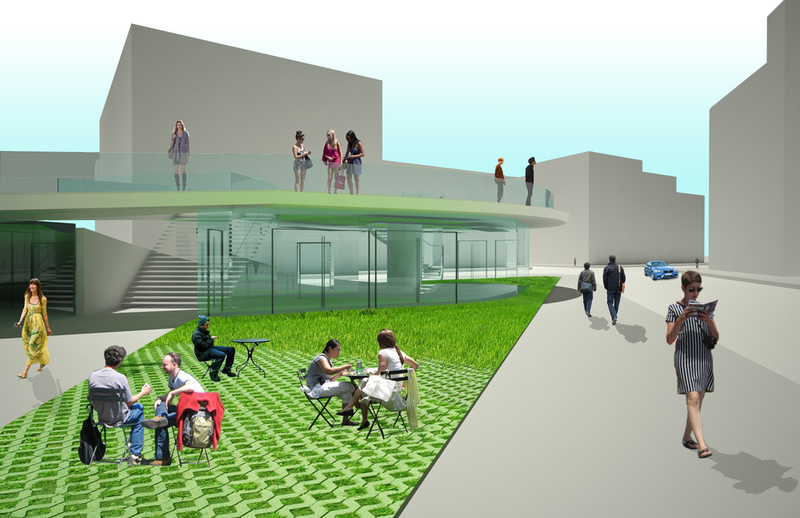 the ELIMINATION OF THE AUTOMOBILE WILL transform 42nd street. the most iconic street in the world, into city front, a global Pedestrian destination. The result is a continuous path of events and public spaces between two active waterfrontS, transportation and recreation hubs, OFFERING EQUAL IMPORTANCE TO live/work, NATURE AND BUILDINGS, NEW YORKERS AND TOURISM, ART AND COMMERCE. THE LIGHT RAIL linear corridor and THE HYBRID, MULTI-FUNCTION GROUND PLANE, Draw from the already DIFFERENT existing areas of activity ALONG THE STREET FABRIC, creatIing the City Front. an exception to the linear light rail corridor IS the plaza located between sixth avenue and lexington Avenue ,completely dedicated to pedestrian activity, flexible and always available for all kinds of social interaction. The new, centrally located, city front center, flanked by major towers, connects landmark sites such as the Chrysler building, Grand Central station, the public library and Bryant park. This area captures the activity of grand central, one of the greatest transportation hubs in the world, but also offers serene, open, natural spaces filled with light, air and water, suitable for leisurly and quiet recreation. the plazacomplements the times square bow-tie, alleviating the crowding within the bottleneck. .The city front pier on the hudson river waterfront, is a commercial destination accessed by the pedestrian bridge from the light rail station. The city front pier is the west side anchor of the corridor. The city front circle park on the east river waterfront is a public destination accessed by a boardwalk from the lightrail station. sloping upwards towards the east river, the boardwalkMeets the circle park, outdoor cinema and promeande plaza. 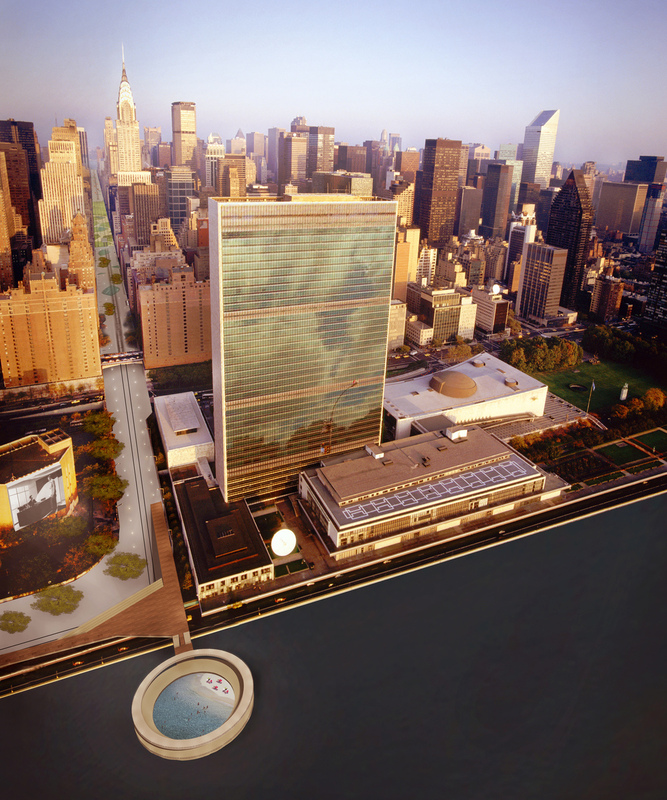 The circle park includes a public pool and a circular deck for viewing east river landmarks and recreational activities. the promenade utilizes theformer fdr drive 42nd street off ramp. The light rail stations located along the City front corridor mark the path at frequent intervals, providing service to all public amenities on a regular schedule.The modular stations, whose imagery recalls horizontal sktscrapers as well as trains, contains information kiosks, cafes, pop-up stores, tech stations and rest areas, the green rooftops serve as viewing decks. an other of the key elements of the city front concept is reflecting sunlight and absorbing less heat, where density is maximum, where a network of water features animates the corridor. A lighting network, located on a grid along the city front corridor,allows for the opportunity to change ambiance for special events and daily functions and manage the flow of the pedestrians. the network also provides anchors for temporary Structures. Our design for the multi-family mixed use project at the Central Ward in Newark, NJ, proposes a commercial base with two endlessly adaptable residential towers that act like “mooring” docks for the shipping containers. The physical connection to the station, the proximity to Newark airport and the mobility of the containers, all cater to global “peripatetic” occupants. Provide a building that questions and inspires behavior, celebrating mobility and flexibility. Create a visual emblem and a geometry that weaves and reflects together the larger surrounding context, celebrating the environment, characterized by transient station, Broad Street station, bridges and overpasses. Create a community that interacts with the Dr. Martin Luther King Jr. Boulevard and downtown. Express and explore the truthful aesthetic expression of the container and of the structural and infrastructural systems. Create a kinetic, “active” structure, a living sculpture that celebrates and responds to the ever-changing conditions of our society. Consolidate ecological functions in the proposed towers and maximize the performance of both the interior and the exterior environments. The commercial base, composed by stacked containers, accommodates multiple functions, organized on different levels, collecting commercial, cultural shopping and entertainment, served by underground parking. The stacked container bars are organized around the perimeter, leaving two open green plazas, which integrate the new mixed use complex into the urban fabric, repairing the connections of the city parts. 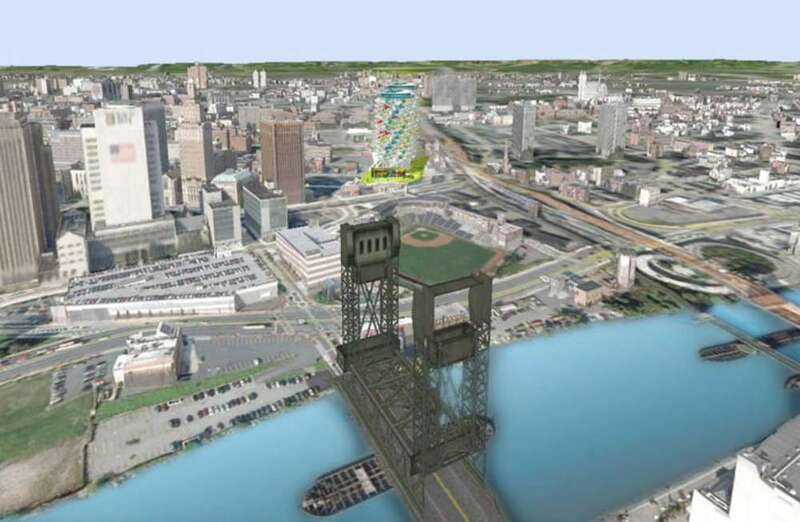 One plaza faces the transient station, being physically connected by an “extended” container, the other plaza faces Orange Street and the city of Newark. The commercial base acts like a giant billboard, very visible from the adjacent overpasses, the super-graphic announces the identity of the complex. A water retention basin adds to the complex performance and acts as visual focal point. The Towers consist of a multi-storey scaffold like steel structure, raised on a platform above the commercial base. The sustainable infrastructure contains an open atrium pierced by the robotic rotating lift, which serves to raise, plug and un-plug the containers, park the cars and move people. The interior community ring is the “street” of the residential community. This is the space where the community can interact. The units are composed by fixed 40’ service-container, (housing bathroom and kitchen and infrastructure hook-ups) and the mobile 40’ living-container which “clips-on”. 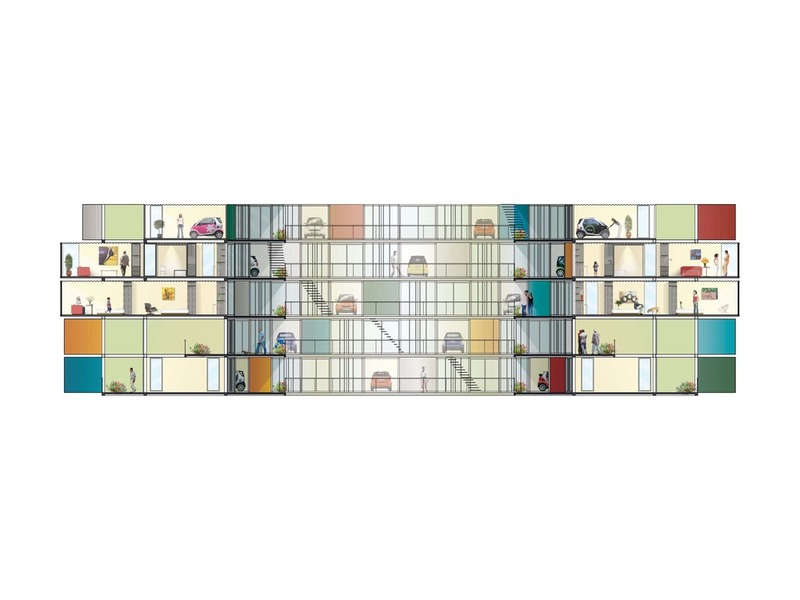 The mobile container, customized by the occupant, moves with the occupant, housing all the belongings, getting unloaded and reloaded, swapping to a container exchange tower in an other Roam City or simply within the structure, in kind of global container “time-share” network. The 20’ container, which acts as the garage and recharging station for the electric car, also moves with the occupant. The Interior fit-out organized by moving “planes” which roll freely and act as a kind of wall units, containing storage and acting as room dividers. The fixed containers, housing the services, repeat and rotate every 12 degrees to allow for the double height interstitial “wedge”; this animates and breaks the mass creating temporary patterns and allows for light, air and views to penetrate the structure. This indoor/outdoor ”courtyard” augments the dwelling space with the device of simple sliding glass shutters. The wedge floor system between the permanent and moveable container augments the containers in width and provides a double height space, closed by glass shutters, it acts as and indoor/outdoor courtyard and as the main space of gathering. 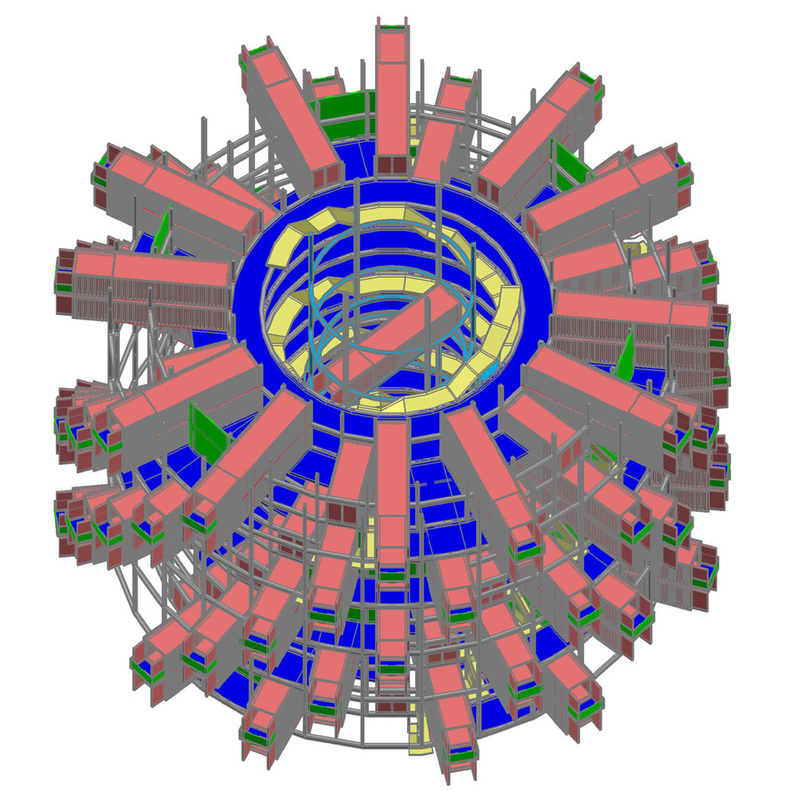 The lightweight metal wedge connects to the main concentric rings of the structure. The structure becomes a vertical suburbia composed of courtyard “maisonnettes” cantilevered in the sky. A green elevated ring garden and common spaces occupy the top level of the tower, solar photovoltaic and hot water panels on the roof provide the energy for the complex and recharge the electric cars. to efficiently access the surrounding conditions of living and commerce.